While a whole roasted head of cauliflower has been on the culinary scene for some time, I gave my recipe the holiday touch by stuffing it bursting full of delicious cheesy stuffing, brimming with collards, mustard greens, and of course plenty of butter! This beauty was created with organic produce for a cooking segment filmed for the CN2 News Today Show at Wild Hope Farm, in Chester S.C. An all organic endeavor,the team at Wild Hope Farm strive to practice regenerative agriculture, and grow delicious healthy foods to serve the local community. Check out their website for harvest share information and market locations. 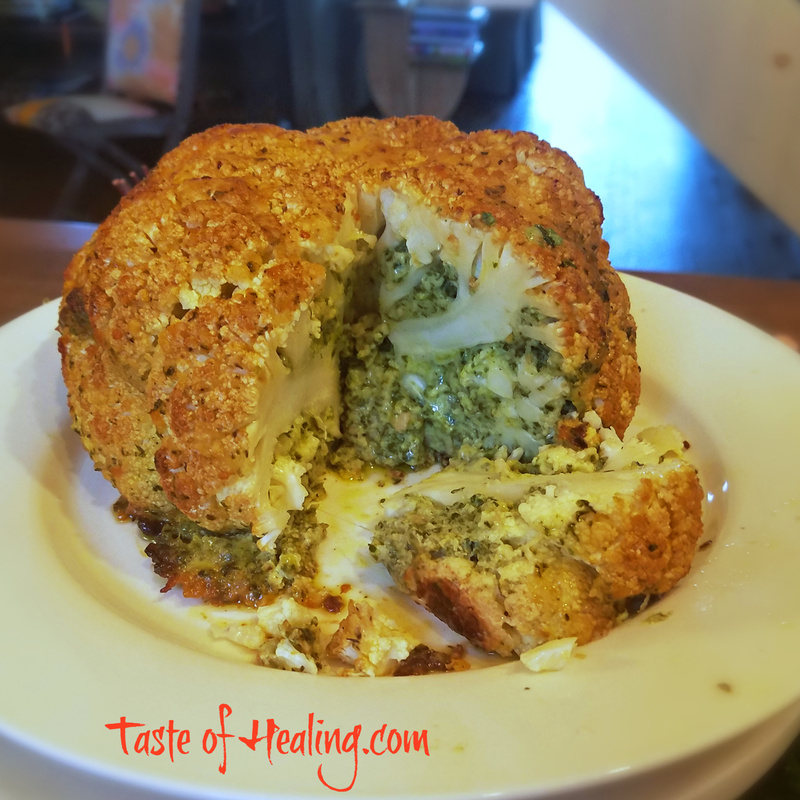 Whole roasted cauliflower is elevated to a new level, filled to the brim with cheesy greens stuffing. Place the greens in the boiling water, allow to wilt (less than a minute), and immediately remove. Place in cold water to cool down, strain and squeeze all the water out of the greens. Place the butter, Dijon mustard, cheeses and seasonings in a food processor and process until combined. Remove about 1/4 cup of the butter mixture and set aside. Add the spring onions and greens to the food processor, and process until combined but still has texture. Place a piping bag in a tall glass or jug, fold over the edges and fill with the stuffing. Turn the of the head of cauliflower over and carefully remove the outer leaves, and as much of the core while keeping it intact. Begin working the stuffing into the nooks and crannies of the cauliflower, pushing the stuffing down until the head begins to ‘burst’ with stuffing. Place the cauliflower head upside down in a roasting pan, and cover with a square of parchment paper. Roast upside down for 15 minutes, this allows the stuffing to sink down further into the cauliflower. Remove from the oven, an baste the top and sides with the reserved cheesy butter mixture. Flip the cauliflower right side up on to the piece of bread, keeping the parchment in place, this creates a ‘plug’ to keep the stuffing in place. Roast for one to one and a half hours, depending on the size of the cauliflower, basting frequently.